The Grenadines are a chain of islands and reefs, including the famous Horse Shoe Reef at Tobago Cays, which are strung out between the northern tip of Grenada and southern tip of St Vincent. 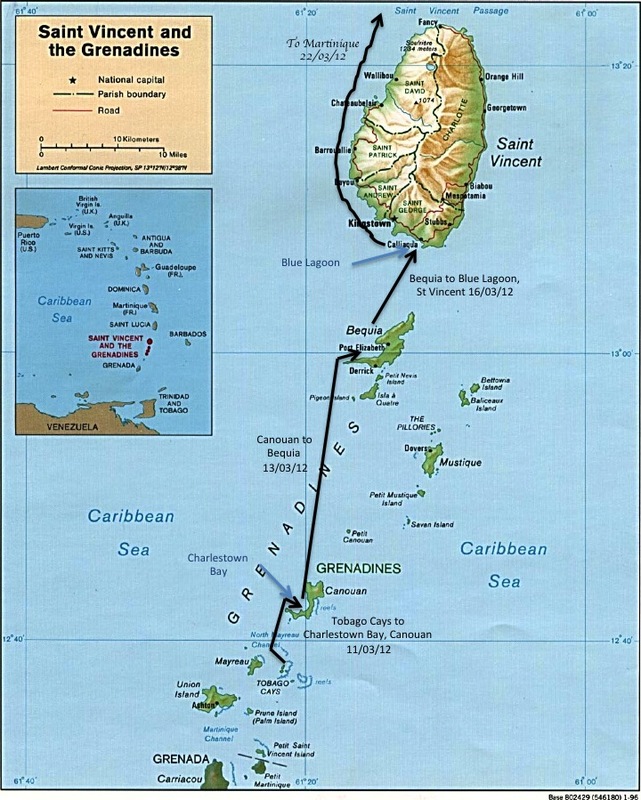 Despite the name of the chain, only Carriacou and Petit Martinique belong to Grenada. The more northerly Petit St Vincent, Palm Island, Union Island, Tobago Cays, Mayreau, Canouan, Mustique and Bequia all belong to St Vincent. 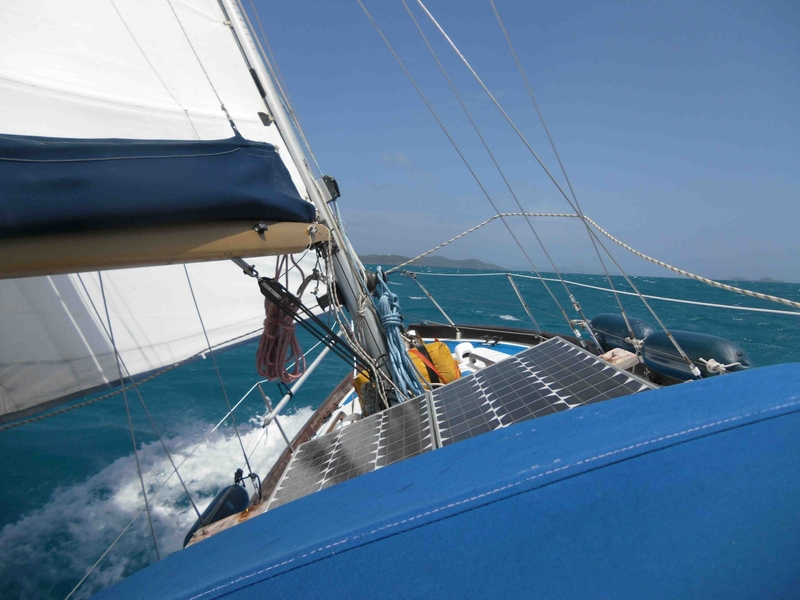 From Grenada the chain bears NNE, which made for some challenging sailing given the strong easterly trades – and correspondingly strong currents setting to the west! 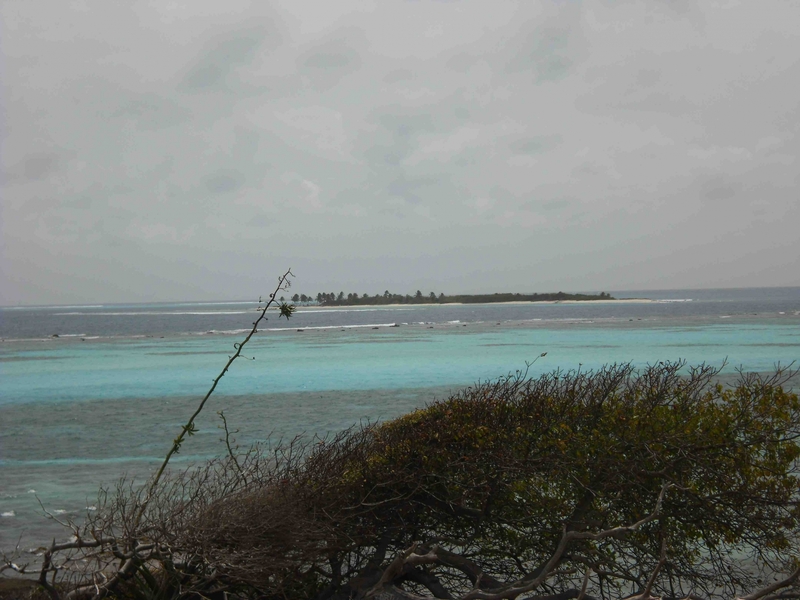 As we passed the small fishing town of Gouyave we started to bear away from the coast due to the wind direction and put a reef in the main as the wind started to strengthen. As expected, the wind got up to a good F5/6 as we cleared Grenada. What we had not anticipated was just how rough and wet it would be! The day started to brighten, but we being softened by thousands of miles of downwind sailing were not overjoyed at the prospect of a tough beat to windward – not quite what we had imagined Caribbean sailing to be. Following our intended bearing proved impossible as the wind was from NE. Worse still, the current was far stronger than we had anticipated and was pushing us further and further west. A grey start to the day. Sailing in this area is made all the more exciting by ‘Kick ‘em Jenny’, an active submarine volcano near Diamond Rock which rises to 180m below sea level. Although the volcano was not known about until it erupted in 1939, sending steam and smoke into the air, the name ‘Kick ‘em Jenny’ appears on many earlier charts in the vicinity of Diamond Rock, presumably because the area has long been associated with strong currents and rough seas. We were certainly getting quite a pasting. 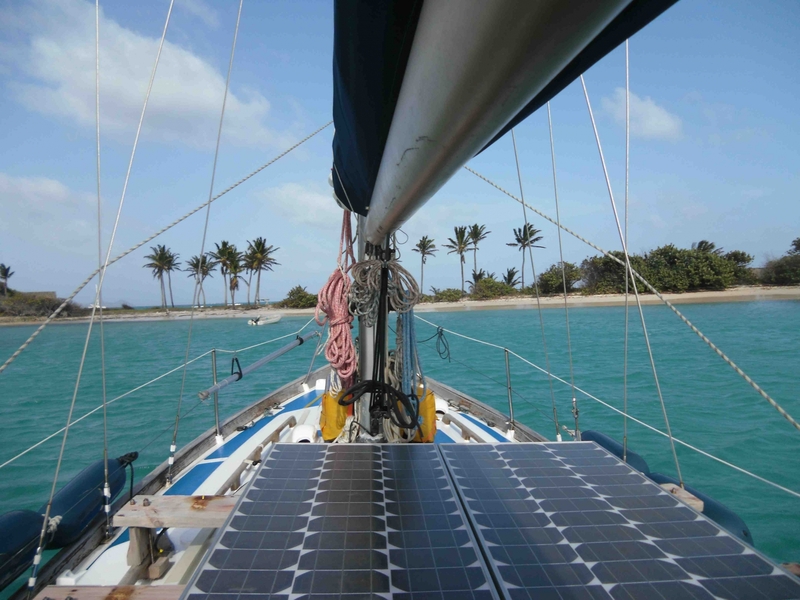 For a while we tried motor-sailing but progress was so slow that by the time we were five miles south of Carriacou (and a good few miles west), about 1330, I decided to cut the engine and put in a series of long tacks. Frustrated with the lack of progress Kate put herself to bed and I passed the time between tacks with a good book. 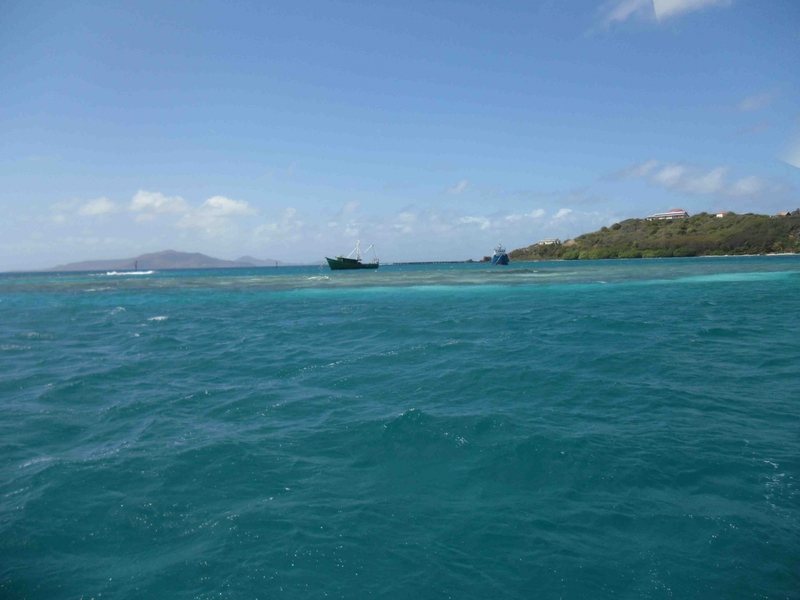 Slowly but surely we clawed our way toward Carriacou. 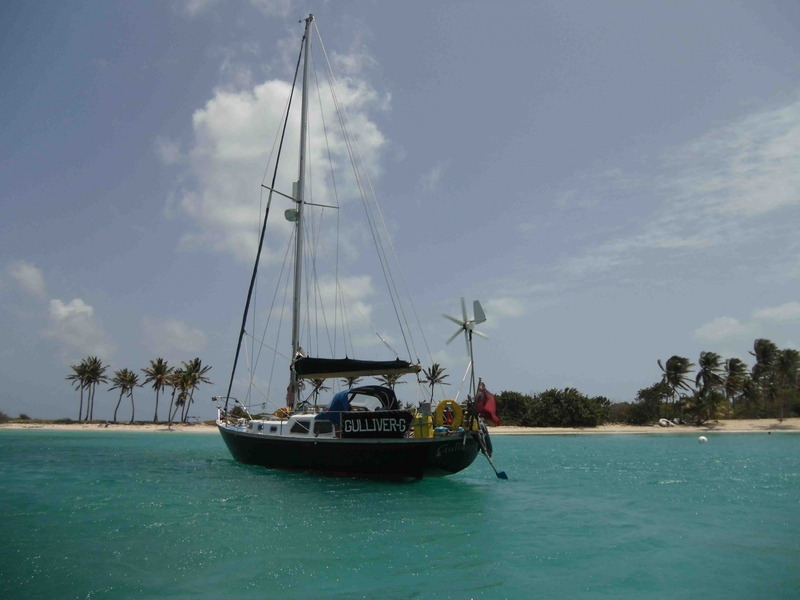 My pride in Gulliver G swelled as the weather got nicer, the seas slightly calmer and our destination (Carriacou as Union Island was by now well and truly out of the question) inch by painful inch closer. 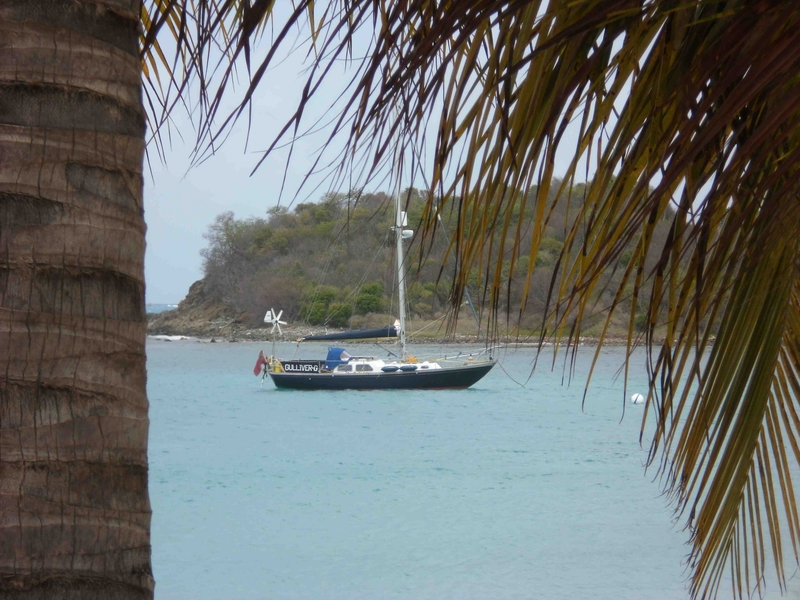 As soon as we were within the lee of Carriacou, around 1730, on went the engine and we floored it into Tyrell Bay to anchor just before dark. It had taken 9 hours to cover what should have been 25NM, though which in fact would have been rather more having been pushed so far west. Many other sailors who, like us, had not done that passage before also struggled to avoid going too far west. Some friends of ours even ended up tacking back to Halifax Harbour having sailed almost up to the latitude of Carriacou but arriving way too far west. They overnighted in Halifax Harbour again and the next day did what we should have done: motored around to the top of Grenada, hugging the coast, before taking the plunge. 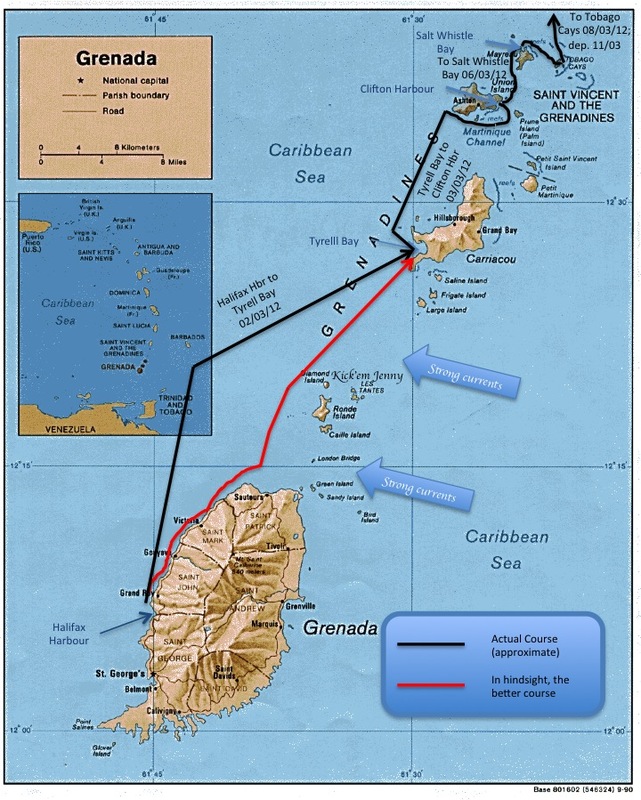 An alternative might be to go up the windward coast of Grenada, but we had not fancied the idea of a slog along a lee shore (to say nothing of having to head east around the bottom of Grenada first) and, in the event, it would have been nigh on impossible with the strong NE wind. Tyrell Bay is a large natural harbour which made for a very comfortable anchorage. The substantial quantity of yachts there suggested that the island was well worth a visit, but having checked out of Grenada a couple of days earlier we were not technically supposed to still be on Grenadian soil, so the next day we pressed on up to Union Island. The distance to Clifton Harbour on Union Island should only have been 10NM and taken a couple of hours, but once again we got pushed too far west and it ended up taking four and a half hours. West of Union Island (in other words, the wrong side as Clifton Harbour is on the east) we were treated to a spectacular aquabatics display by a very large pod of dolphins. By way of distraction, on Gulliver G a potential mutiny was unfolding. Kate wanted to start the engine whilst I wanted to sail round the island. During the course of this debate, the dolphins a’ploshing and a’sploshing around us, the island was becoming ever distant, so in the end I capitulated and a good thing too for soon we were motor-sailing along some stunning coastline. By mid-afternoon we were at anchor in Clifton Harbour, stern pointing towards Roundabout Reef – quite literally, a large round reef in the middle of the harbour which boats have to go around. 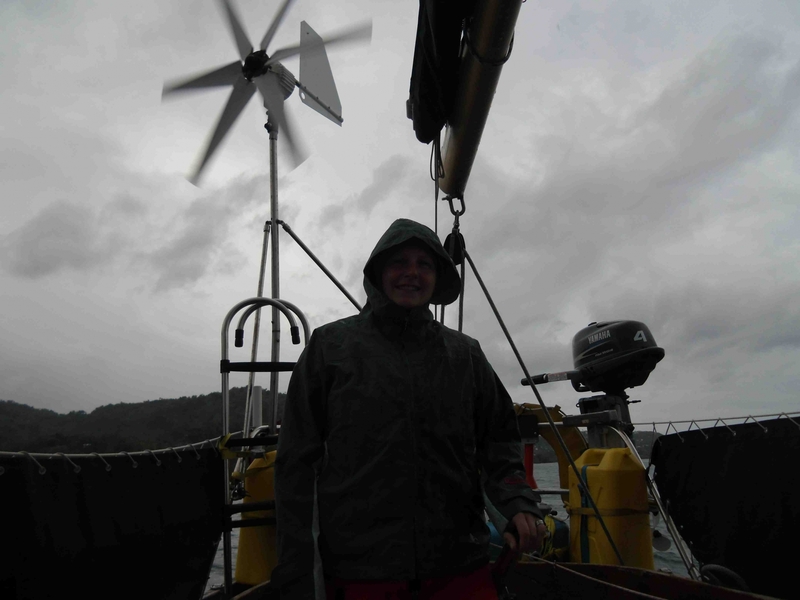 It had taken 3 days to get from Prickly Bay to Clifton Harbour, a total distance of under 45NM! In those parts we’d no intention of ploughing on after dark as there were a lot of reefs dotted about and to have approached any of the anchorages in the dark would have be rather foolish. In Clifton Harbour we were surrounded by reef, with Roundabout Reef astern (fortunately the holding was good, as the wind remained a steady F5/6 whilst we were there) and a semi-circular barrier reef ahead. Behind the barrier reef lay a strip of flat water popular with Kite Surfers. 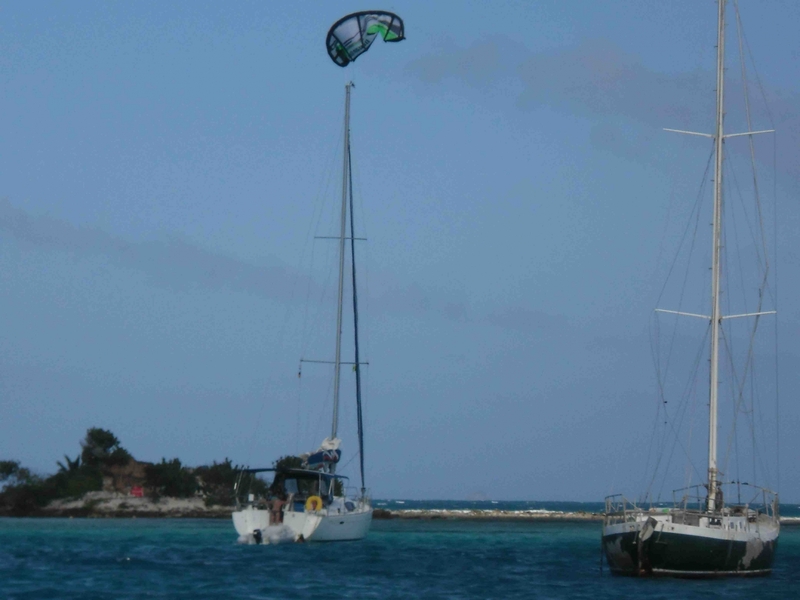 The kite surfers looked so graceful, so skillful, so… oops! We had been a trifle concerned that customs and immigration at Union Island might query the fact that we had checked out of Grenada three days earlier, but we managed to catch them just as the clock struck home-time, so they did not look at our documentation too closely. As expected, Union Island was far more expensive than Grenada and we were relieved to have stocked up down south. The reason? We were in American charter cat territory. 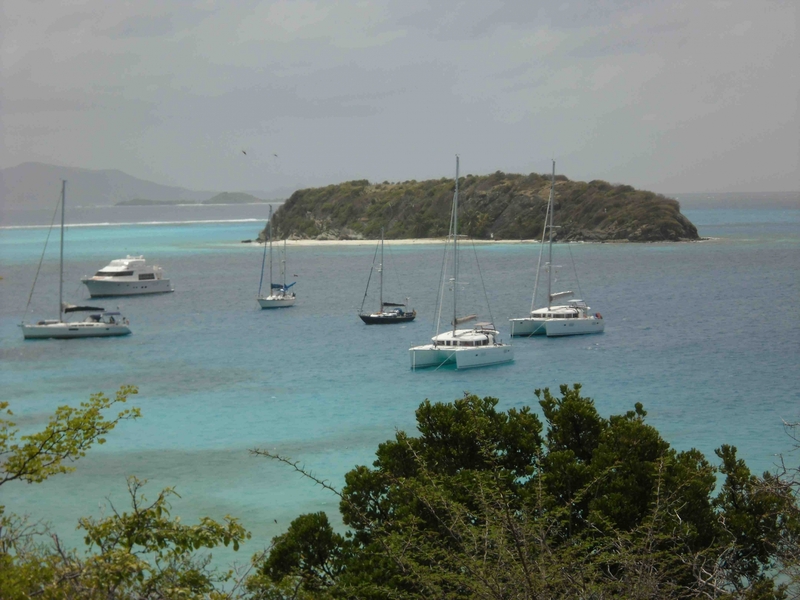 I do not mean to write about Americans negatively in general for we have met many very fine and interesting American sailors, but the Americans who descend on the Grenadines to charter a catamaran for a week or two unfortunately bring one particular bad habit with them: tipping. Whilst I was filling some water bottles, a well-dressed local chap on the quay-side insisted on helping me get them into the tender. We had a friendly chat. When I mentioned that I was going off to buy some bread he offered to ‘accompany’ me, even though I could see the bakery from where we stood. I could see where this was headed, so declined. As I walked off to the bakery he helped some Americans untie their tender. They motored back to the quay brandishing bank notes. “What’s your name?” Asked one of the Americans. “Bob,” said the chap on the quay side, who was wearing a Bob Marley hat. When I got back to the quay, feeling as if I had just been thoroughly ripped off for a loaf of bread and wondering whether I could take it back, ‘Bob’ greeted me. “Maybe you have five EC for me,” he said. To me this little event exemplified just how absurd the American habit of tipping is. People who rely on tips for their main income have to downgrade themselves to earn them, whilst at the same time having the potential to get more in the short term through tips than they perhaps would by earning valuable consideration in exchange for services rendered, which in turn disincentives them from developing and advancing their skills which in turn means they ultimately have no fall-back position when those with the money stop handing it out. 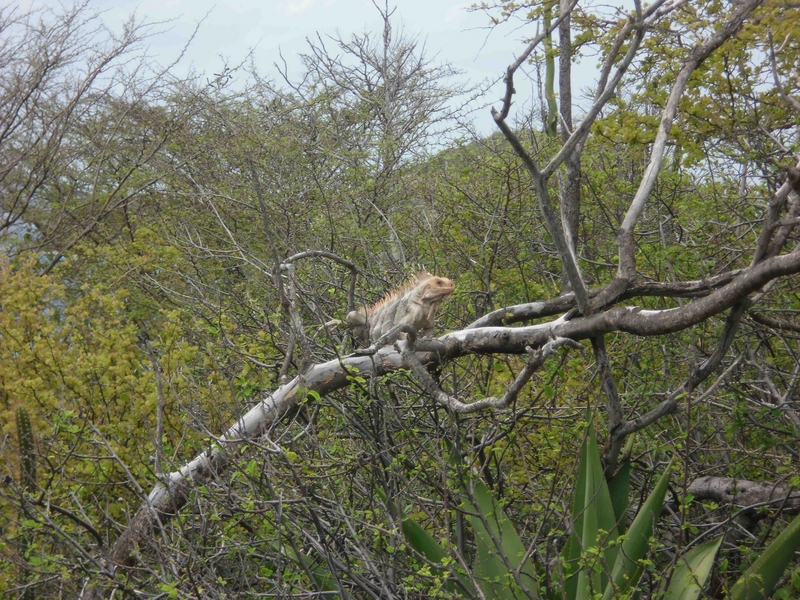 Although Union Island and the main village of Clifton were very pretty, the abundance of charter cats had encouraged a something of a hustling community (not too bad, but certainly not the Caribbean of open – and free – friendliness we were used to). 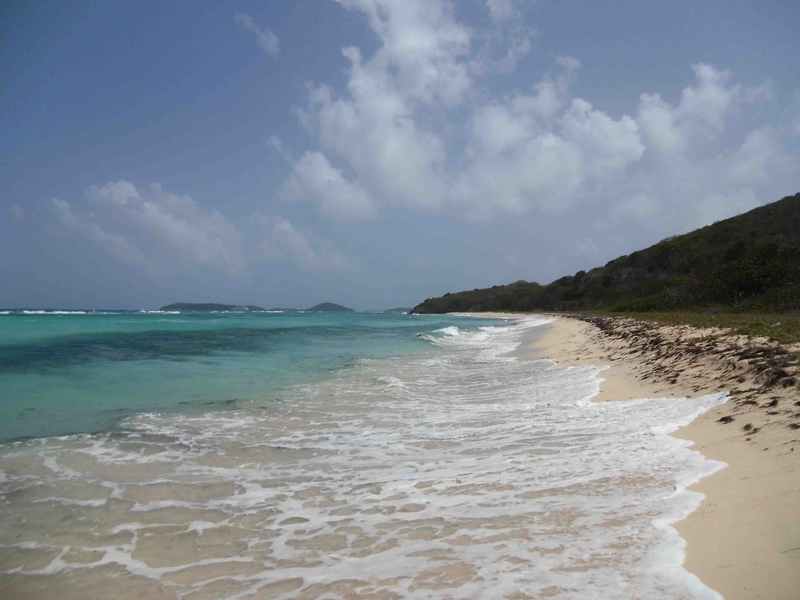 After a couple of days we were ready to move on, this time to picture-postcard-perfect Salt Whistle Bay on the very small island of Mayreau. Leaving Union Island behind (top left), Gulliver G enjoyed a short fast romp to Mayreau (top right), arriving in short order at Salt Whistle Bay (below left) where, after a few attempts at getting the anchor to hold we managed to dig in a short swim from the beach. 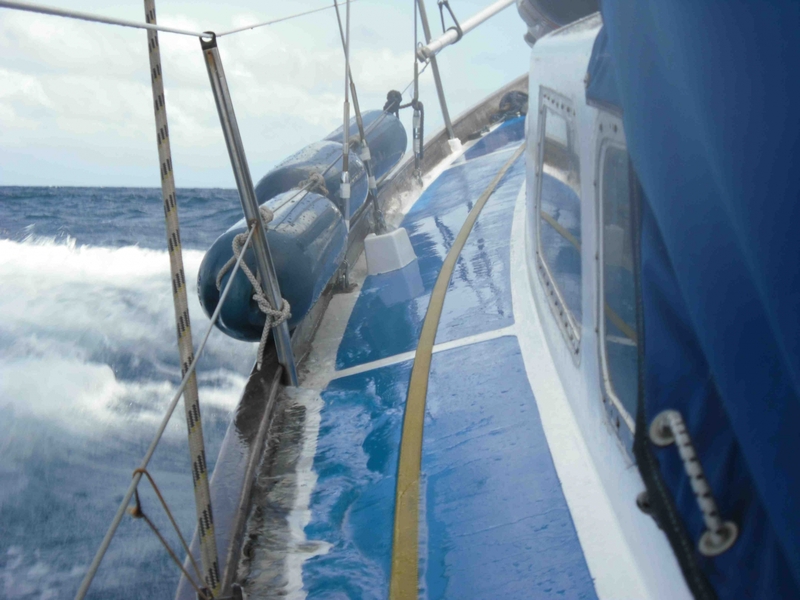 The passage was short and fast – our best sailing since crossing the Atlantic. All too soon we were entering Salt Whistle Bay, which looked about half full and had a number of moorings laid. We dropped the anchor on the outside of the anchorage and had to reset two or three times before it would bite – normally it would take first time. Then when it did set we found that we were in a really rolly spot, so up it came again. One of the boatmen (locals who go around the anchorages in their boats offering fish, bread, general services and, in many cases, ganja) came over and asked what our draught was. 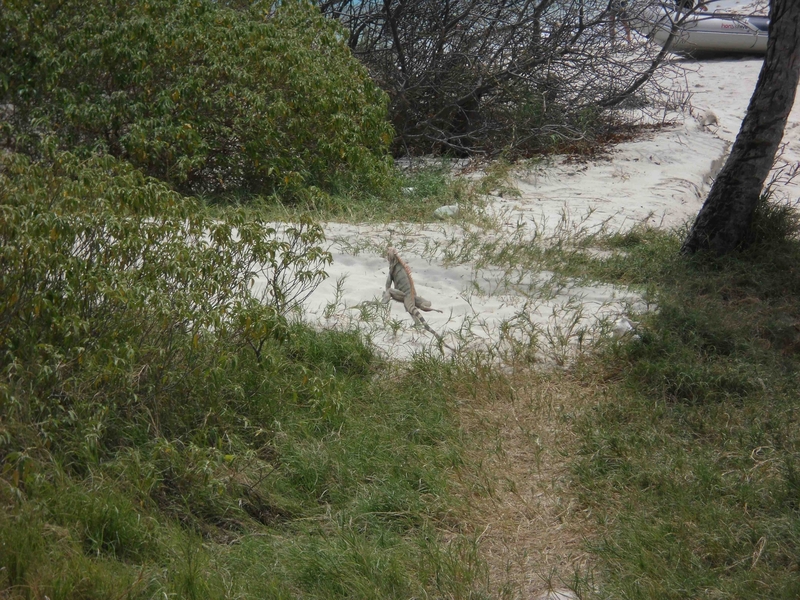 He then directed us to a spot right in close to the beach. When our depth gauge was showing only half a foot under the keel (we weren’t too worried as it was flat sand and we were going dead slow with an offshore wind), he shouted out “Drop now!”. Down went the anchor. Despite the shallow depth, after the previous problems this time we played out a scope of about 6:1 as the strong wind blew us back. The anchor held and there we were, right at the front of the pack with the finest view of the beach. After Union Island I expected the boatman to want money, but he didn’t; merely exchanged a few pleasantries. 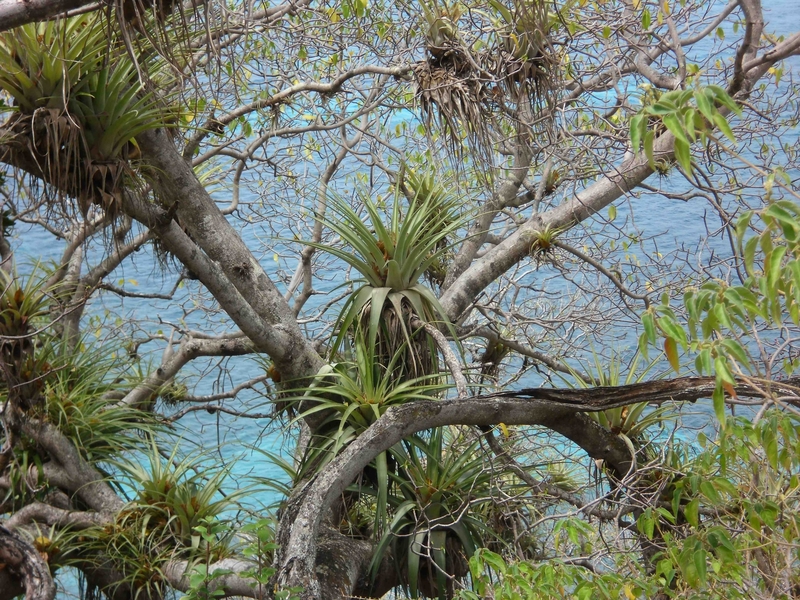 We were fast learning how much, throughout the Caribbean, the islands vary significantly from one another in terms of atmosphere – even those which are technically part of the same country can have very different vibes. 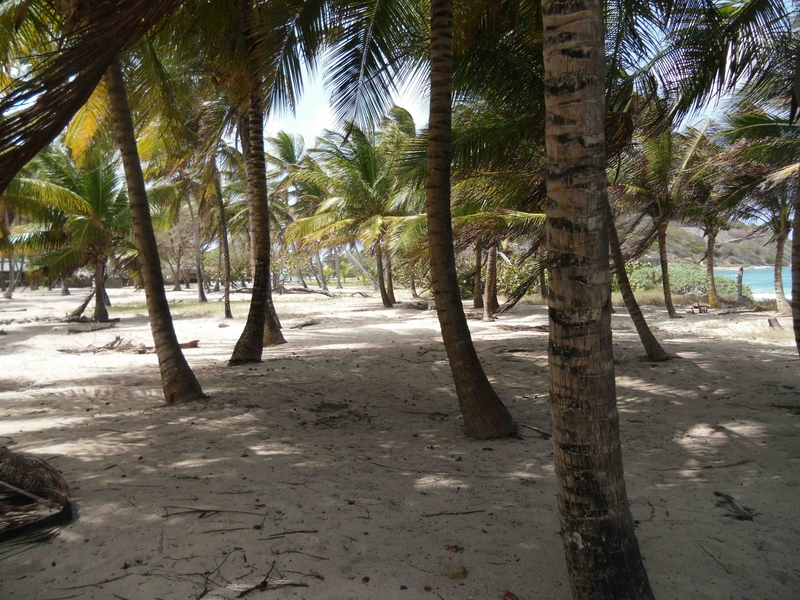 Mayreau is a delightful little island of only 3km2, all pastel coloured houses, palm groves and sandy beaches. 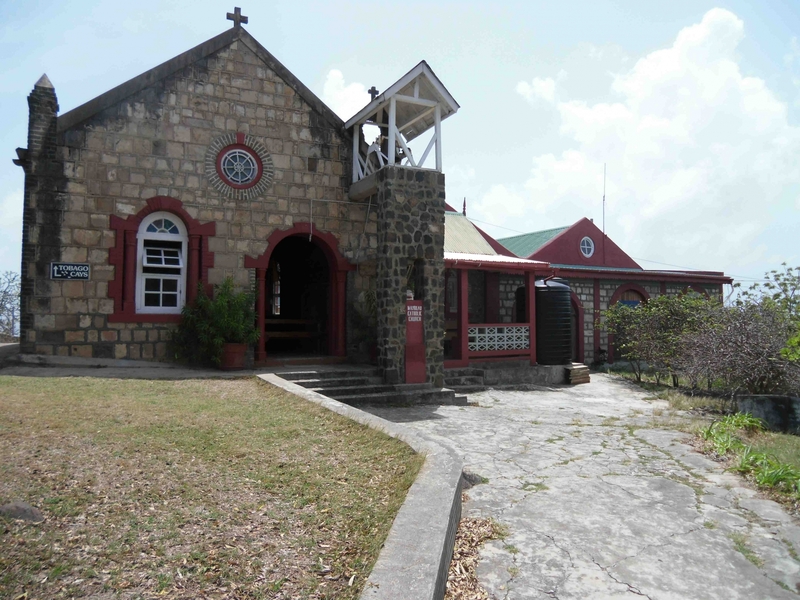 On the top of the island, at about 70m, stands the little Catholic church built by the late Father Divonne, a Dominican monk who moved to Mayreau a few decades ago and, by all accounts, was of great service to the locals. His greatest achievement was undoubtedly showing them how to build a reservoir, an essential thing to have in a saline environment with a small landmass and sporadic rain fall. The priest was also closely involved in tracing the history of the people of St Vincent and the Grenadines. The current population of the Grenadines, as with much of the wider Caribbean, is descended mainly of Africans from the slave trade, with quite a bit of Caucasian and Asian blood mixed in over the generations resulting in a wide variety of hues and facial features. There is a significant Asian presence in many of the larger islands. There remain hints of Carib here and there, the people with whom the islands were populated when Columbus arrived in the late fifteenth century and who were promptly almost entirely wiped out by Europeans vying for control of the islands – and who would bring African slaves with them, buying them at slave markets on the west African coast which the European ships conveniently had to pass in order to reach the Caribbean. For an account of the Carib people and general notes on the anthropological history of St Vincent and the Grenadines (the islands are thought to have been populated since at least 3,000 BC), I highly recommend a webpage which reproduces a text written by Rev Fr Adrien Le Breton SJ (1662 – 1736) which was discovered by Father Divonne and has been edited and published by the Mayreau Environmental Development Organisation with an introduction by Father Divonne. The page may be found here. 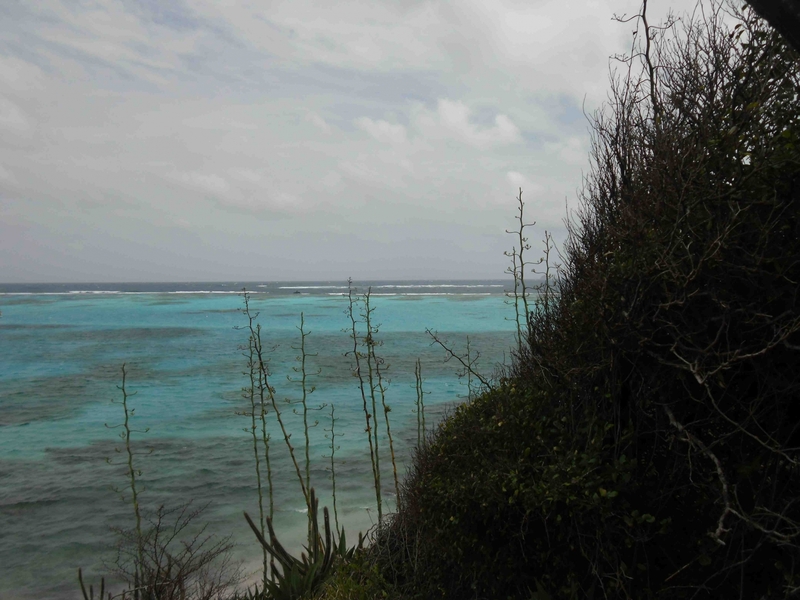 …as well as the complex of reefs closer in to the windward side of Mayreau (according to our pilot book there is an anchorage in there somewhere!). A 3NM sail took us around the top of Mayreau, down through the islands of Petit Rameau and Petit Bateau (two of the five small uninhabited islands which, with the reefs, make up the Cays), to an anchorage just south of Baradal, protected from the Atlantic swell by the impressive Horse Shoe Reef. With the trades still blowing strongly from NE it had been a fast beat in hot and sunny conditions. 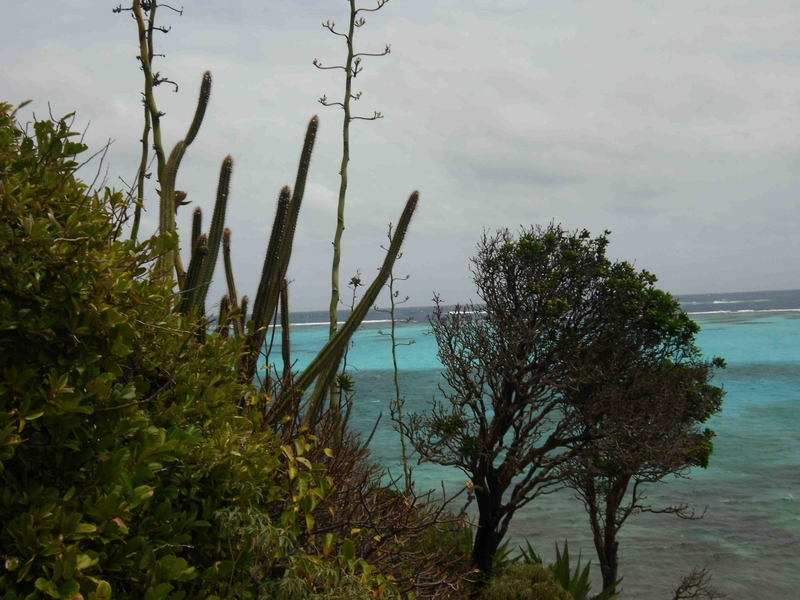 There we were, bang in the middle of the Tobago Cays Marine Conservation Park. 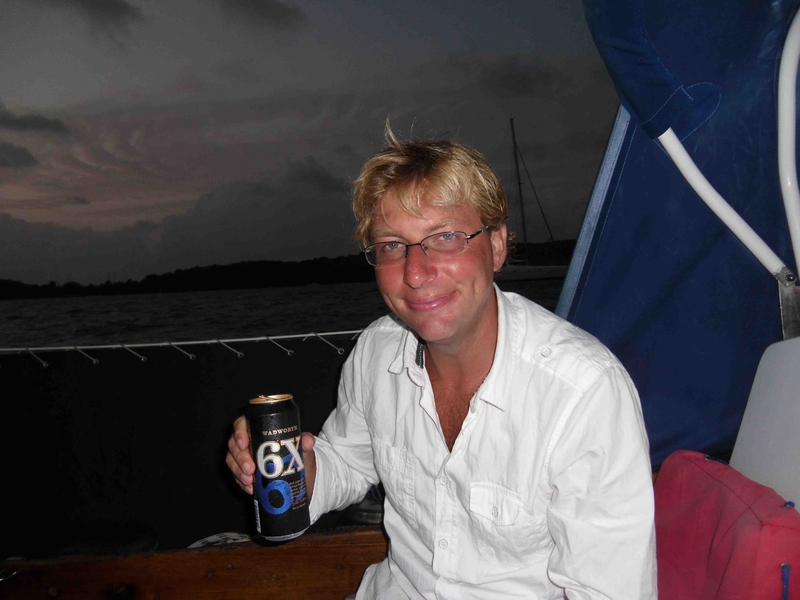 Time to crack open a can of Wadsworth’s 6X which had sailed all the way down with us from the UK. After months on lager, it was a real birthday treat to enjoy a proper beer in such idyllic surroundings. The next day (9th March) was Kate’s birthday. 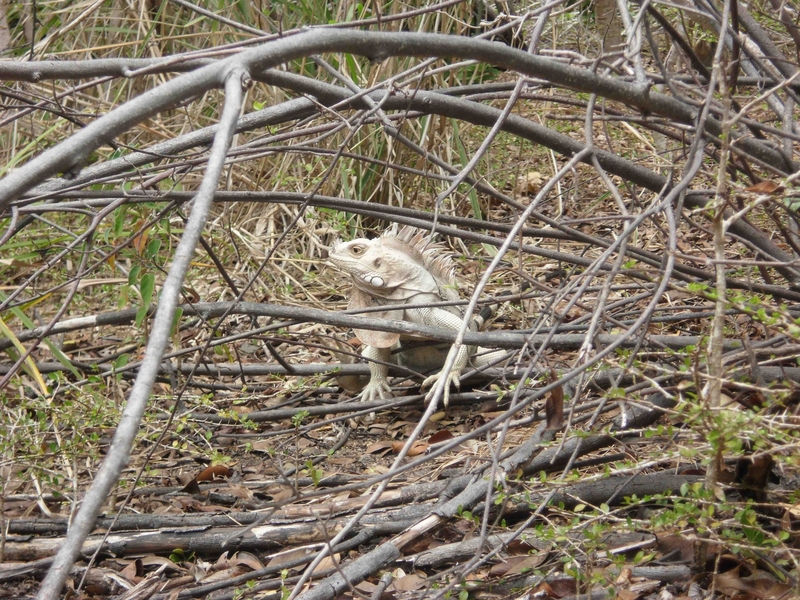 We spent it exploring the island of Baradal, which is bedecked with a wide variety of vegetation and is crawling with iguanas. These are strange, pre-historic looking beasts which will shake their heads at you if you get too close, before running away. In Baradal Turtle Sanctuary we were able to snorkel with green and hawksbill turtles, watching them glide over the sea-bed as they munched at the sea grass. Over the next couple of days we discovered the great snorkelling to be had out at the reef itself, with a vast array of colourful fish of various shapes and sizes. It felt as though we were snorkelling in a giant tropical aquarium! We lamented the fact that we did not have a waterproof camera. We also proved that the camera we did have was most definitely not waterproof when it took a dousing in the bottom of the tender. Fortunately, we had got some good pictures before it died. 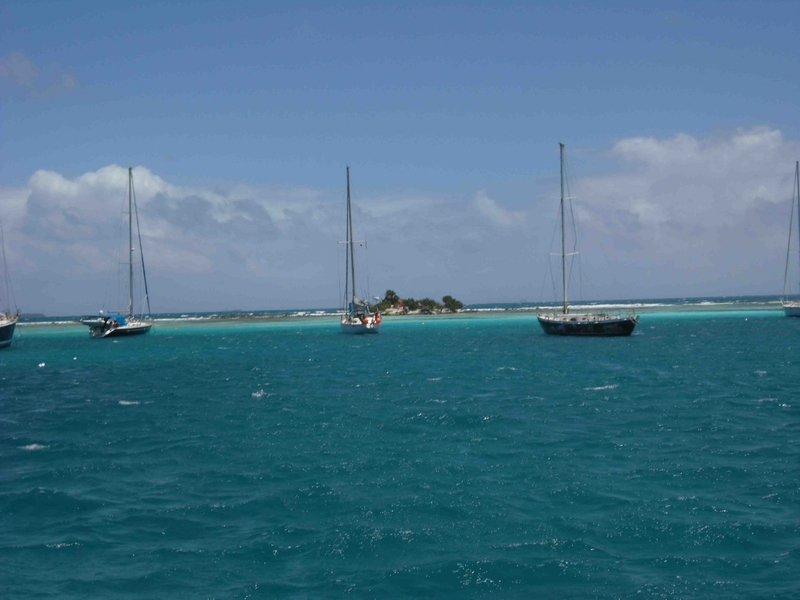 As you can see in the picture of Gulliver G anchored between Baradal and Jamesby (above right) we were in charter cat territory, but there is ample space in the Tobago Cays for none of the anchorages to feel remotely crowded. Aside from the odd wave in greeting or a fish held aloft, the boatmen left us alone, recognising that the rich pickings were to be had from the catamarans. 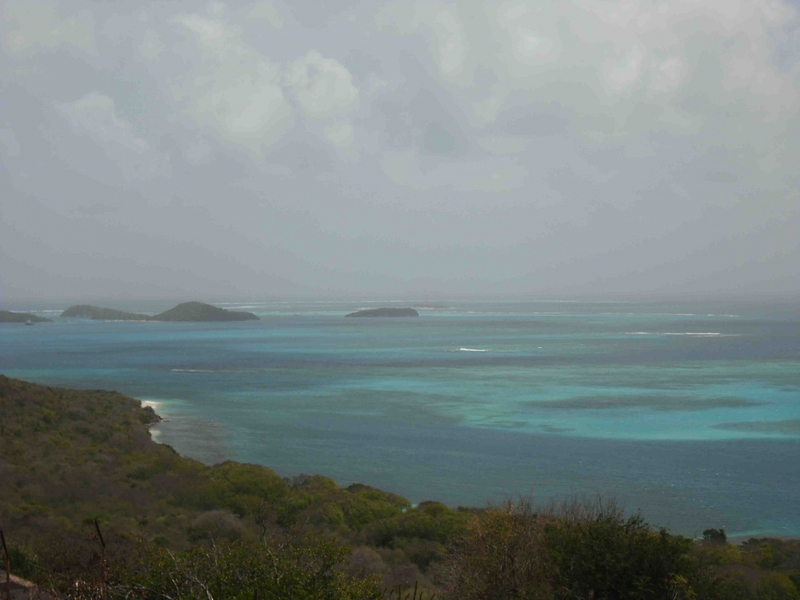 Both Mayreau and the Tobago Cays were somewhat lacking in rubbish facilities – indeed, they have no facilities, which is excellent – and by the 11th March the bin bags in our cockpit locker were beginning to smell a little ripe. Time to head northwards to Canouan. Map from the CIA; modifications by and (c) G P Caesar 2012. 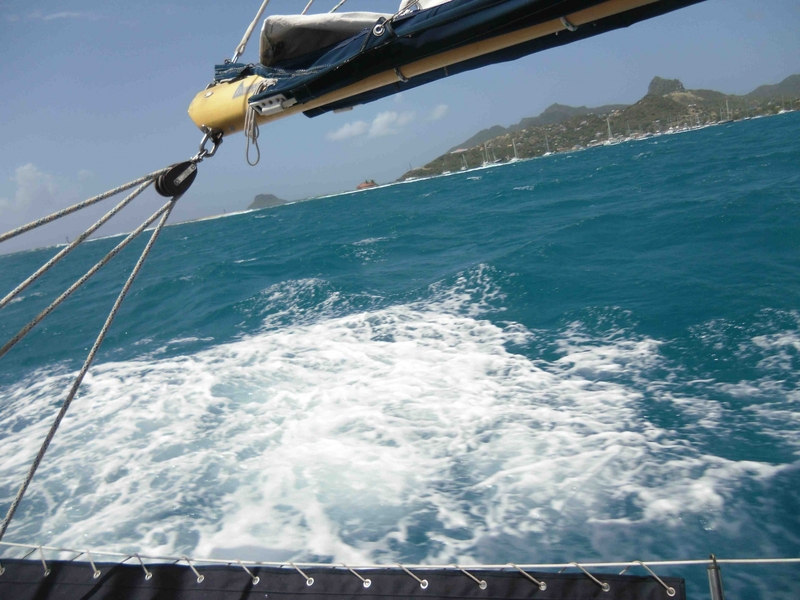 A lot of boats cruising the Grenadines give Canouan a miss, preferring to go straight for Bequia from the Cays (or vice versa), but as we had to pass it we thought that we may as well call in. 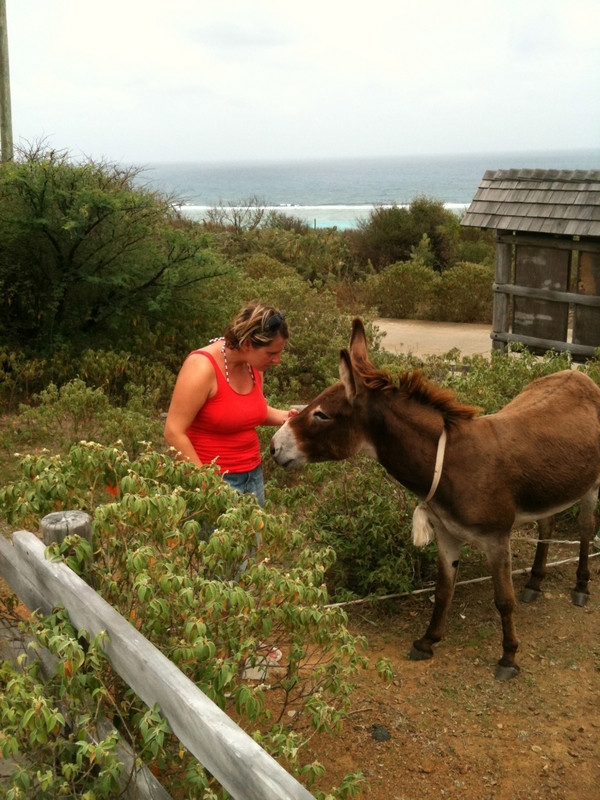 Canouan is a funny little island. Our pilot book mentioned that, being remote and secluded, a number of luxury hotels had opened in recent years. So far as we could tell, the island only had luxury hotels, most of them well blended in to the coastline. I checked out some of the rates online: a couple of nights on Canouan will set you back more than the average person in the Caribbean earns each year (about US$6k). Despite the island being a favourite holiday destination of some very wealthy people, the town, Charlestown (really a large village), home to the island’s 1,200 inhabitants, had a distinctly poor feel to it, many of the houses run-down or not properly finished, dogs and chickens roaming the unkempt gardens. The biggest resort is the Raffles Resort up at the north end of the island. This takes up one of the island’s three-square miles. Locals were forbidden entry to the resort grounds unless they worked there (from the state of Charlestown and the number of expat workers about it appeared that few did). 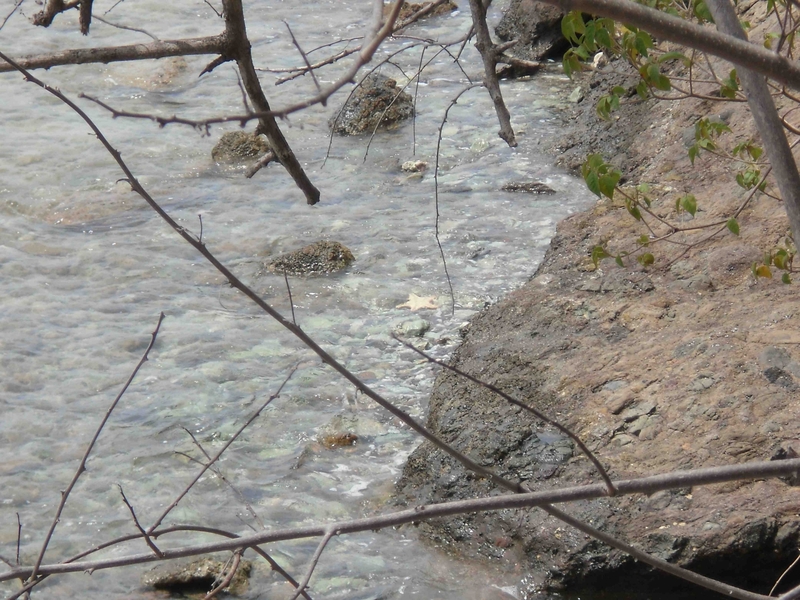 However, the beaches remained public property and locals were supposedly allowed access by boat or through the resort. 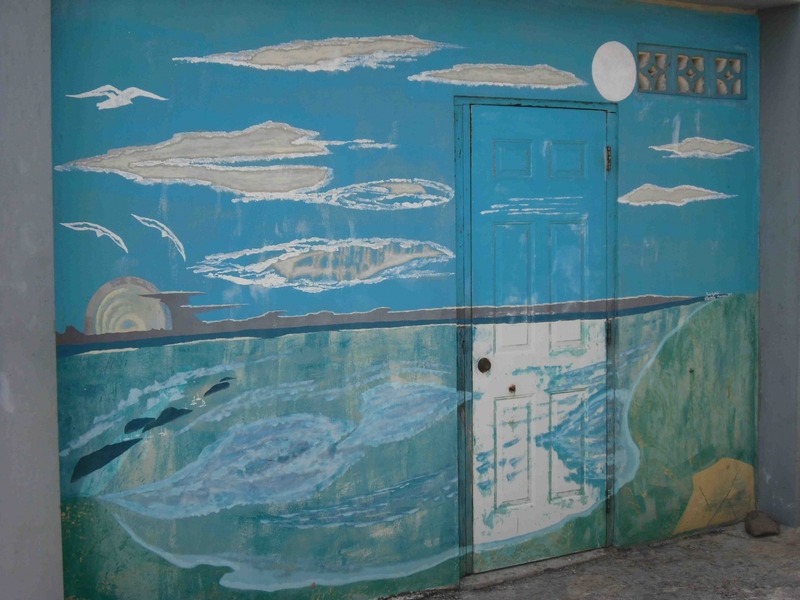 The story went that when the resort development began locals were banned from the beaches, which essentially precluded them from fishing off the north end of the island. The locals then banned the resort developers from using public roads, of which there were only one or two. As both the port and the air strip were at the southern end of the island this meant that the developers could not do anything, so the agreement about use of the beaches was reached. We took a little stroll around the island, during which, using the iPhone, I managed to get shots of the barrier reef off the windward coast (below), Gulliver G at anchor in Charleston Bay (below left) and Kate making friends with a donkey (below right). When we reached a back entrance to the resort security turned us away, saying that the grounds were private and that there was no right of way through them. Clearly we did not look like residents. That evening a massive yacht, registered in Bikini in the Marshall Islands, arrived in Charlestown Bay. The vaguely radio-active Marshall Islands are rarely visited by yachts, but the flag is popular with rich people trying to avoid tax. Due to it’s size, the yacht had to anchor pretty far out. But it turned out that the owner was not staying on board. A rib roughly the size of Gulliver G was launched as a number of trim young men in pressed uniform shorts and polo shirts jumped to attention on deck. The rib was loaded with a few tons of suit cases and golf clubs, which were ferried to a nearby dock where they were they were landed and whisked away by resort staff. The rib returned to the yacht to collect the owner, who was seated in what looked like a throne in the middle of the rib. 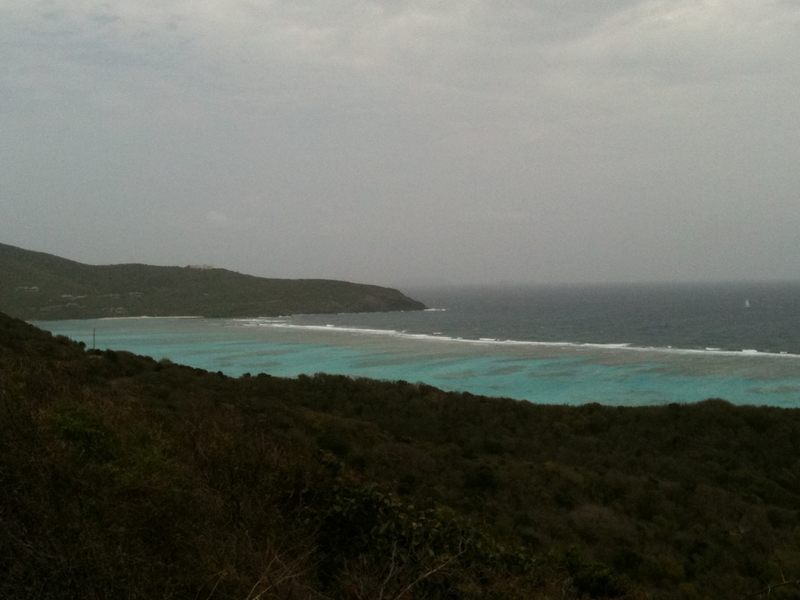 Such extremes of wealth as we saw on Canouan can be a little nauseating. 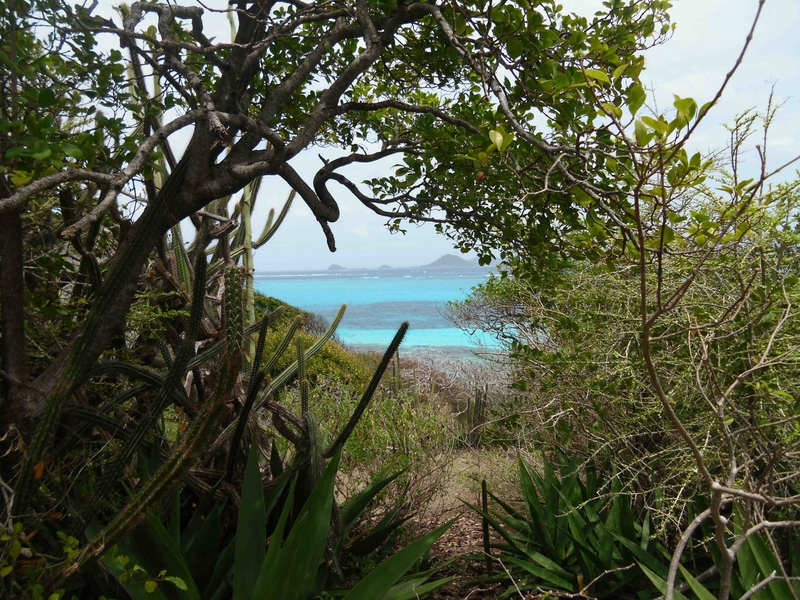 On Tuesday 13th March we decided that, short of selling our house and checking into a resort for a few hours, we had seen and done pretty much all that there was to see and do around Canouan. 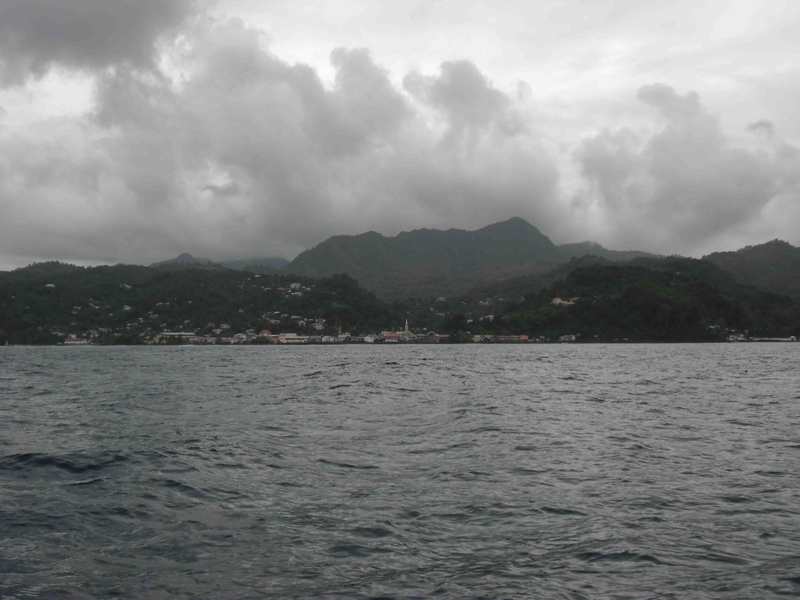 The next stop was to be Bequia (pronounced ‘Beck-way’), just under 20NM north. 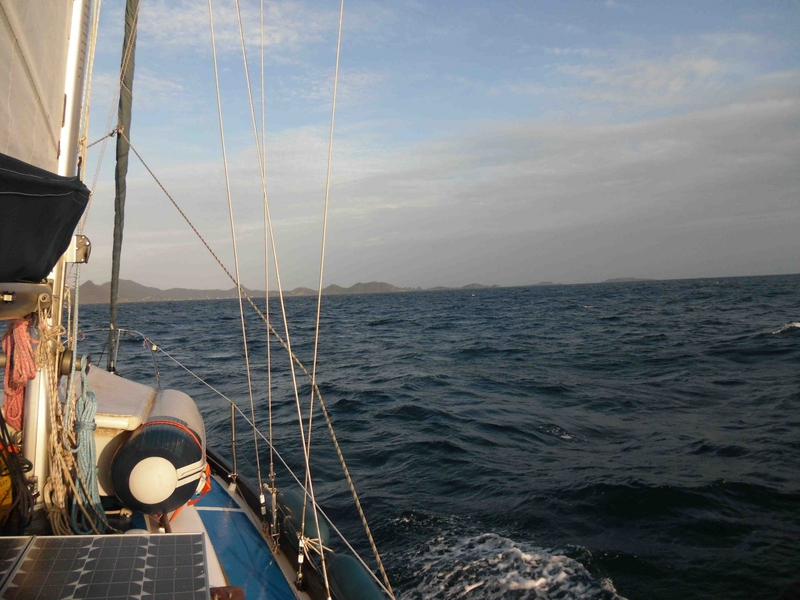 By this point the west-setting current was becoming much weaker and we were going almost due north making for much more straightforward sailing than we’d had in the southern Grenadines. 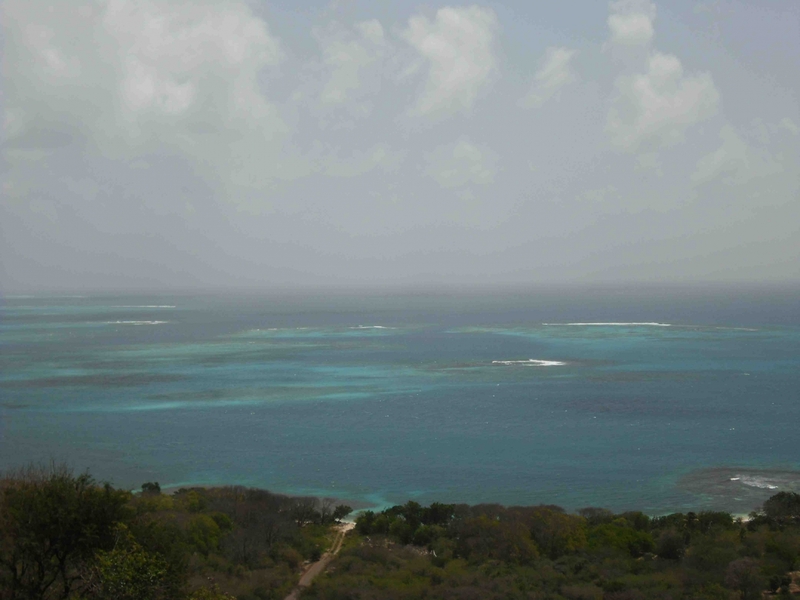 Once around West Cay, Bequia’s extreme SW point, we had to zigzag our way into Port Elizabeth – a further three miles to the east – with a series of tacks. Back in Grenada friends had told us that Bequia was their favourite place in the Grenadines and as we got in we could see that they were not the only ones to like it. Port Elizabeth was packed. Rather than anchor on the south side of the bay, where the really nice beaches were along with a lot of moorings and loads of boats, we went for the far less populated north side, anchoring in a neat little spot close in to the quiet road which runs around the edge of the bay. This proved fortuitous as there was a really good laundry right next to us and the bakery was only a couple of hundred yards away, where we were able to buy bags of rolls for EC2 compared to EC15 for a loaf around the other side of the bay! There are about four East Carribean dollars to the pound. The stroll around the Bay to the bars and beaches was very pleasant. Whilst bread was expensive on the south side we found that we were able to get a good lunch of rotis there at a reasonable price. 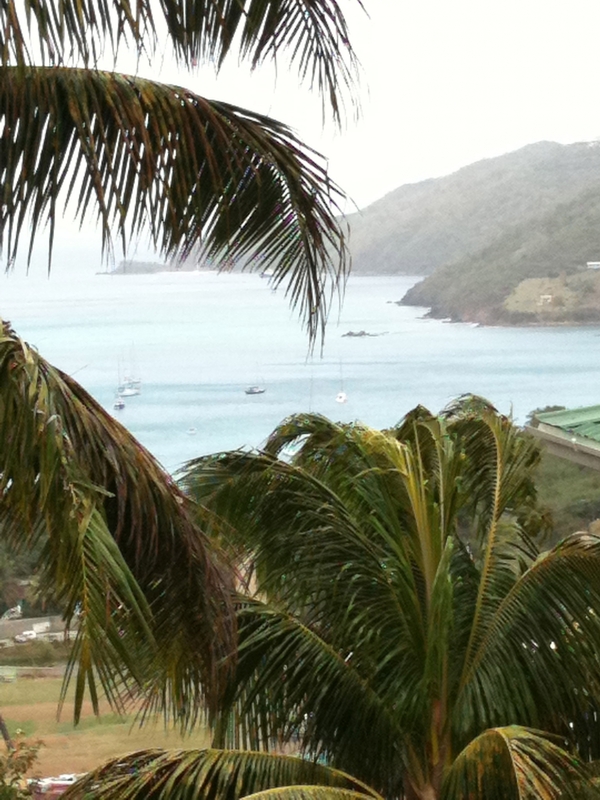 Bequia was very nice: colourful, friendly and not as expensive as we had feared, if you figured out where to go. In St Vincent we spoke to a young local woman who said that her main ambition was to one day live there. But one thing in particular left a lasting impression: diving on the anchor I discovered that the harbour floor was totally covered with old wine bottles. Very odd! 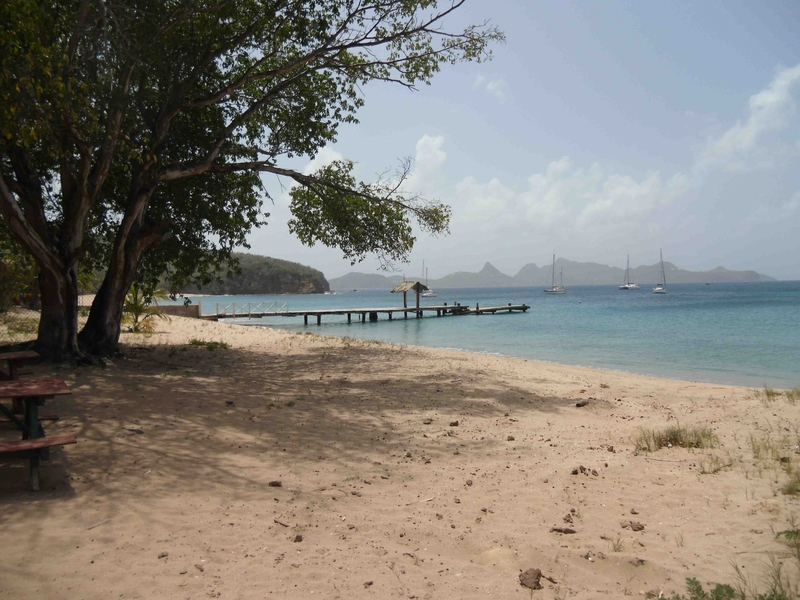 We could have happily stayed longer in Bequia, but had an appointment to keep in St Vincent and on the 16th March once again found ourselves weighing anchor.